Mark Garrett, Borealis CEO, Eldar Sætre, Executive Vice President Statoil; Markku Korvenranta, Executive Vice President Base Chemicals, Borealis. Borealis, a leading provider of innovative solutions in the fields of polyolefins, base chemicals and fertilizers, announces a new long term agreement to source ethane from Norwegian Statoil for its flexible steam cracker in Stenungsund, Sweden. 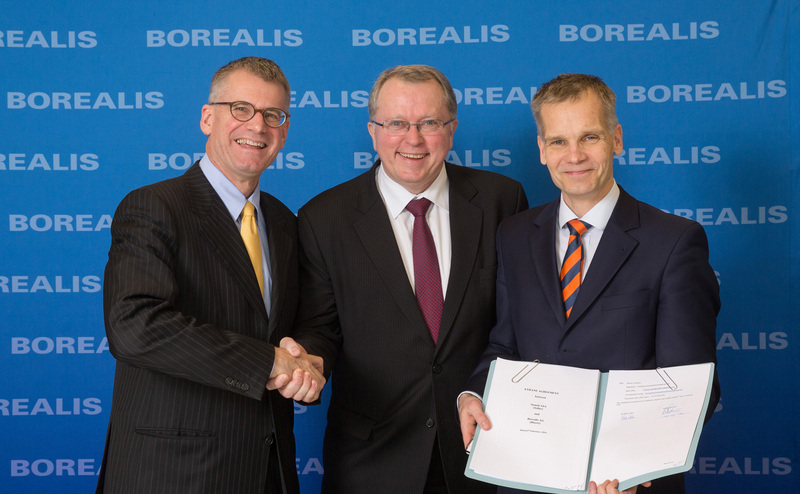 This contract will continue to provide Borealis with an attractive source of feedstock for its petrochemical complex in Stenungsund. Borealis and Statoil have renewed the contract for the supply of ethane from Statoil’s gas plant at Kårstø, Norway, which will secure a significant volume of ethane to Borealis’ cracker in Stenungsund for the coming years. The ethane supply has been agreed at competitive terms for both parties, taking into account the global change of the ethane market due to the availability of US shale gas. The new contract will start in October 2015 and last for a period of 7 years. Borealis’ cracker in Stenungsund is one of the most feedstock flexible crackers in Europe. Apart from ethane it can also crack naphtha, propane and butane. Stenungsund has significant liquefied petroleum gas (LPG) storage capacity, allowing the company to source LPG from various sources with vessel sizes up to very large gas carriers. Borealis’ Polyolefins capabilities position the company’s business in Europe among the leading and innovative supplier to the polyethylene (PE) and polypropylene (PP) market. Statoil is an international energy company with operations in 33 countries. Building on 40 years of experience from oil and gas production on the Norwegian continental shelf, we are committed to accommodating the world's energy needs in a responsible manner, applying technology and creating innovative business solutions. We are headquartered in Stavanger, Norway with approximately 23,000 employees worldwide, and are listed on the New York and Oslo stock exchanges.